This isn't a complete list of all the site's articles, just the ones from the last few years. 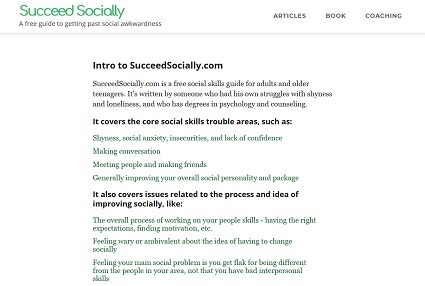 Click here to browse everything I've written on social skills. Does Meetup.com Work For Making Friends? I'm now offering one-on-one social skills coaching, via video chat. Click the link for more details. The Idea That Basic Social Skills Are Just "Common Sense"
Why Can Your Confidence And Social Skills Fluctuate So Much? Does 'Fake It 'Til You Make It' Work For Improving Your Social Skills And Confidence? 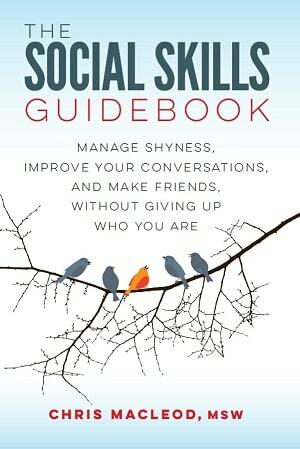 The audiobook version of the The Social Skills Guidebook is now available. The length is 9 hours and 23 minutes, and it covers the same material as the paperback and ebook versions. You can get it for US$19.95 on Amazon or Audible. The audiobook version of the The Social Skills Guidebook is coming out soon. It will be sold on Audible.com / Amazon, and be up in early February. I can't give an exact date because part of the process is out of my hands; once I submit the audio files to the online store, they can vary in how long they take to make the title available for purchase. I'll make another update when it's for sale though. What Do People Actually Do At Parties? How Much Do You Really Need To Improve Your Fashion Sense To Be Socially Successful? The old article made a quick case for why working on your looks can benefit your social life, then gave some quick general tips on ways to improve your appearance. The new version is more about the question of how important adjusting your look actually is. Is It Worthwhile To Seek A Formal Asperger's Syndrome Diagnosis If You Think You Have It? It’s Okay To Be Less Social, Be Quiet, Not Like Sports, etc.